In 2005 weeds were estimated to cost Australian agriculture between $2.5 billion and $4.5 billion per annum. For winter cropping systems alone the cost was $1.3 billion, equivalent to around 20 per cent of the gross value of the Australian wheat crop. In the intervening period herbicide resistance has become far more widespread, reducing the effectiveness of a wide range of herbicide modes-of-action (MOAs). Consequently, any practice that can reduce the weed burden is likely to generate substantial economic benefits to growers and the grains industry. Of particular concern to farmers is the development of glyphosate resistance. At the time of writing there are 24 weed species around the world that are resistant to glyphosate, with six in Australia. There is also a large increase in species tolerant to various other herbicides, but glyphosate in particular. This loss of glyphosate’s effectiveness is creating great concern in industrialised farming systems globally and it is exacerbated by the widespread adoption of herbicide resistant crops estimated at 110 million hectares in 25 countries. Until recently North American research and extension programs have focused on herbicide solutions to herbicide resistance problems; however, with glyphosate resistance they are being forced to look at a more comprehensive weed management program. This puts Australian farmers in the enviable position of having been exposed to the integrated weed management message for nearly 20 years. Integrated weed management (IWM) is a system for managing weeds over the long term, particularly the management and minimisation of herbicide resistance. There is a need to combine herbicide and non-herbicide methods into an integrated control program. Given that there are additional costs associated with implementing IWM, the main issues for growers are whether it is cost-effective to adopt the system and whether the benefits are likely to be long-term or short-term in nature. Read about the original concept for the Integrated Weed Management Manual. Use https://grdc.com.au/IWMM to ensure your link remains current and up-to-date! Introduction (PDF 5.1 MB) This section includes: Contents, Foreword, Introduction and Manual outline. The manual is divided into seven sections, to assist the reader make the development of an integrated weed management (IWM) plan a simple process. Section 1: Economic benefits of adopting integrated weed management (PDF 4.9 MB) Outlines the economic benefits of IWM in Australian cropping systems using computer model simulations. Section 2: Herbicide resistance (PDF 5.3 MB) Section 2 seeks to clarify aspects of herbicide resistance in weed populations. It is crucial to understand the basics of herbicide resistance when managing weed populations that are resistant to one or more herbicide groups, or are at risk of becoming resistant. Section 3: Agronomy to enhance the implementation and benefits of weed management tactics (PDF 5.4 MB) Discusses a range of agronomic practices that can be used to enhance the results of the specific weed management tactics employed. Section 3 includes many simple and cost-effective management changes that can be made to improve the competitive ability of a crop. 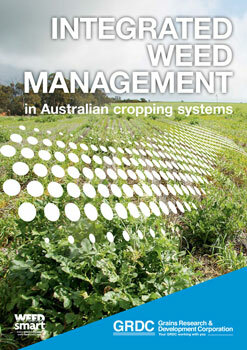 Section 4: Tactics for managing weed populations (PDF 8.8 MB) Provides detailed information on available weed management tactics and presents trial results from across Australia. The tactics, sorted by tactic group, are addressed individually. Where a tactic can fall into two tactic groups because it impacts on two stages of the weed’s life cycle, it has been grouped according to its major aim. Section 5: Implementing an IWM program using tactics groups (PDF 5.2 MB) The ‘doing’ part of the manual, outlining how best to assess the on-farm situation and implement the IWM plan on-farm. The information that should be collected for each paddock is listed, so that an effective weed management plan can be prepared. Section 6: Profiles of common weeds of cropping (PDF 8.1 MB) Section 6 details the characteristics of 23 key weeds of annual cropping across Australia. Information includes basic identification, distribution and traits that make the weed a significant problem in cropping systems. For each weed there is a recommendation of the most suited weed management tactics for control. Section 7: Case studies (PDF 6.6 MB) Section 7 includes a number of grower case studies collected from across Australia. These are an invaluable resource highlighting how growers are actually implementing IWM. These case studies look at what caused and helped them change, successes and the challenges of integrated weed management.